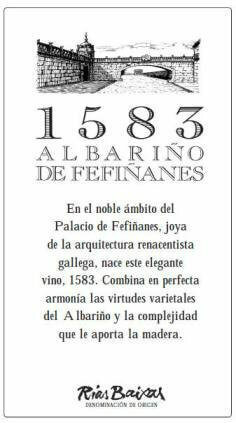 Fefinanes Albarino de 1583 Albarino is made from 100% Albarino. Aged for 5 months in oak barrels (a combination of fine-grained American and French Allier barrels). 1583 is the birth date of the Viscount of Fefinanes, Gonzalo Sarmiento Valladares, builder of the Castle of Fefinanes, in Cambados. They wanted to pay tribute to their ancestor with this wine that managed to reach a perfect harmony between the fruitiness of the Albarino grape and the complexity brought by the oak aging. Lovely straw yellow color, clean and bright. The nose is reminiscent of ripe crystallized fruit and spices. The palate is elegant, round and well balanced, with a silky texture. Excellent with shellfish, grilled or stewed fish, white meats, poultry. "Fatter, fleshier, and more textured than the straight Albariño, the 2017 Albariño 1583 is another brilliant white from this estate that’s well worth seeking out. Notes of green apples, spice, and crushed rocks all flow to a medium to full-bodied white that has a dense, layered mid-palate, terrific balance, and a great finish. This beauty is geared for the dinner table and, as with the base cuvée, it should keep for 2-4 years easily. This cuvée is 100% Albariño that spent four months in French and American oak followed by two months in stainless steel."